The manufacturer, VIP Electronic Cigarette, says this is the first time the act of using an electronic cigarette – or vaping – has been shown on television. It appeared in an ad break in Grantchester, ITV1’s smoke-wreathed drama about a 1950s country vicar who falls over corpses in between lighting cigarettes. responsible. This rule applies to all advertising, and the plan is to add guidance specific to e-cigarettes. The BMA’s view is that the ad glamourises and sexualises the use of these e-cigarettes and is therefore socially irresponsible. non-nicotine-users to use e-cigarettes. The BMA says that the ad doesn’t refer to the product being intended for use by smokers or existing nicotine users – although CAP’s notes for Rule 8 say that it doesn’t require every ad to be targeting smokers or e-cigarette users explicitly. The ASA received over 1000 complaints about a previous VIP ad, aired late last year. An ad making health claims for e-cigarettes and another that ‘relied heavily on the iconography of tobacco smoking’ are among ads about e-cigarettes that the ASA has barred. In 1962, a then-controversial report by the Royal College of Physicians on smoking and lung cancer and other diseases first raised the question of advertising restrictions, pointing out that “any increase in public education concerning the risk of smoking would at present be in conflict with the vast expenditure on advertising tobacco”. the indoor use of e-cigarettes in public and work spaces, saying there is evidence that the exhalants can increase the background air level of some toxicants, nicotine and particles. advertising, promotion or sponsorship that targets young people and non-smokers (and people who don’t use nicotine). If the evidence shows…….there’s the rub. This is a fast-moving field – a gold rush said Cancer Research UK in its 2013 report on the marketing of e-cigarettes. Properly conducted trials designed to produce clear results – and the formulation of effective policy that takes this evidence into account – take time, if they happen at all. 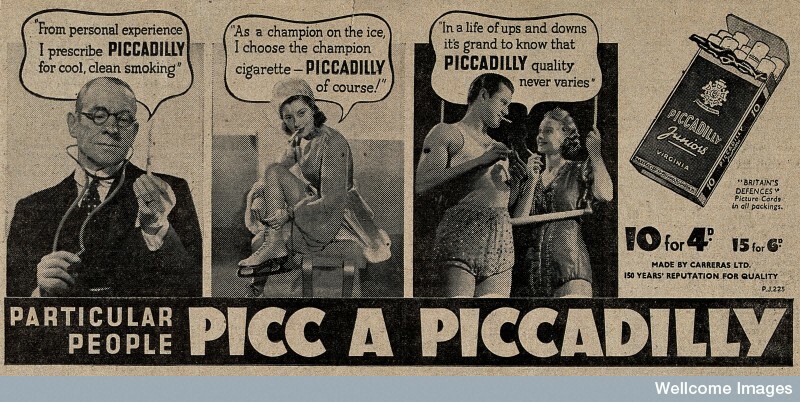 A 1939 Piccadilly ad showing enthusiastic smoking by an ice skater, two trapeze artists, and a doctor ‘prescribing’ the brand for “clean smoking”. Wellcome Library, London. Decades ago, the industry made links between smoking and health. As the Cancer Research UK report points out, though, there is now something new: e-cigarettes can be presented as part of a responsible harm reduction strategy. If the industry “gets this right, it will own both the problem and the solution”. A research unit at Stanford University School of Medicine, which looks at the impact of tobacco advertising, has made some striking comparisons between the advertising of cigarettes and e-cigarettes including Mother’s Day promotions from 1940 and 2013. It has also compiled a gallery of e-cigarette ads arguably aimed at teens with such delights as a banana split flavour. ASA website, adjudication on Must Have Ltd 26 February 2014, accessed 20 November 2014; adjudication on Nicocigs Ltd 5 May 2013, accessed 19 November 2014; adjudication on E-Cig Ltd 12 November 2014, accessed 20 November 2014. BMA website, press release 19 November 2014, accessed 20 November 2014, and accompanying letter. CAP website, press release 9 October 2014, accessed 19 November 2014. Cancer Research UK report written by de Andrade M et al. The marketing of electronic cigarettes in the UK, November 2013, downloaded 20 November 2014. Gravelle A. ASA censures e-cigarette brand VIP after more than 1,000 complaints, Marketing magazine website, accessed 19 November 2014. Royal College of Physicians. Smoking and Health 1962, downloaded 20 November 2014. Stanford School of Medicine website, Stanford Research into the Impact of Tobacco Advertising, accessed 19 November 2014. VIP electronic cigarette website, blog 10 November 2014, accessed 19 November 2014. World Health Organisation. Backgrounder on WHO report on regulation of e-cigarettes and similar products, 26 August 2014, accessed 20 November 2014. World Health Organisation. Electronic nicotine delivery systems. Report by WHO, 21 July 2014, downloaded 19 November 2014.